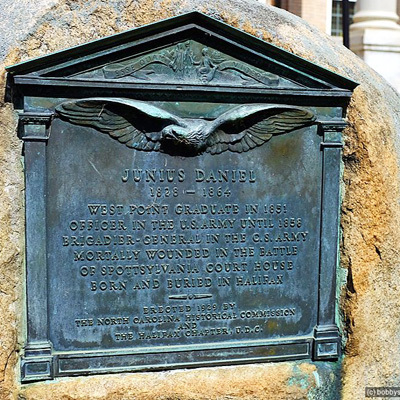 A bronze tablet attached to a large boulder commemorates General Junius Daniels. The tablet was cast as the front elevation of a Greek revival architectural style building. In relief on the building’s pediment are several components from the Great Seal of the State of North Carolina, to include the state motto ”Esse quam videri” meaning "To be rather than to seem". Also prominent are the figures Liberty and Plenty facing towards each other. A bas-relief eagle in flight is directly below the pediment with the inscriptions appearing below the eagle’s spread wings. ERECTED 1929 BY / THE NORTH CAROLINA HISTORICAL COMMISSION / AND / THE HALIFAX CHAPTER, U.D.C. About 300 people were present for ceremonies presided over by Mrs. Edward L. Travis, president of the Halifax Chapter United Daughters of the Confederacy. The ceremonies were opened by a procession of the Weldon American Legion Post led by Gus Pappas a naturalized American Citizen from Greece. After a speech by Judge Hunt Parke the tablet was unveiled by Miss Mary Long Daniel. The ceremony ended with the Rosemary Band playing “Dixie” and then “Taps” as the American Legion members marched off the grounds. The memorial marker is located on the front lawn of the Halifax County Courthouse, N. King Street near the intersection with W. Pittsylvania St, in Halifax, NC. The boulder stands on the front lawn, to the left from a walkway and stairs to the main entrance of the courthouse building.